Somewhere between downtown Utsunomiya in Tochigi Prefecture, and the village of Ogisu an hour’s drive to the northeast, Dr. Tatsuhiro Ohkubo pulls over to buy a box of sakura mochi. Back on the road, he passes one of the bright-pink rice cakes to the back seat for Dr. Sergiy Zibtsev, who is visiting Japan for the first time. His tall frame folded grasshopper-fashion into the small car, the Ukrainian forest ecologist bites into the salted cherry leaf wrapped around the rice cake. Ohkubo doesn’t miss a beat. “Prunus speciosa,” he says. Ohkubo, 53, also a forest ecologist, can match Zibtsev thrust for thrust in Latin-laced banter. Despite the light mood, however, the pair’s mission on this late March morning is somber. They’re on their way to visit an organic farmer whose forests have been contaminated by radioactive fallout from the ongoing crisis at the Fukushima No. 1 nuclear power plant about 100 km to the northeast. Some 70 percent of Fukushima, and a similar portion of neighboring prefectures, is covered in forests. Managing the aftermath of the recent nuclear disaster is therefore largely a question of managing contaminated forests — but almost no one in Japan knows how to do that. Fifty-year-old Zibtsev, a professor at the National University of Life and Environmental Sciences of Ukraine in Kiev, does — he has been studying forests contaminated by the 1986 Chernobyl nuclear disaster on and off for 19 years. Ohkubo, who teaches at Utsunomiya University, has been doing the same, in Japan, for just one year. 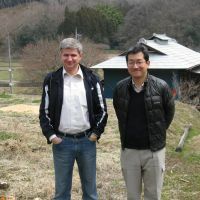 The two met in 2005 at Yale University’s famed School of Forestry and Environmental Studies, where Zibtsev was a Fulbright scholar and Ohkubo a visiting associate professor. 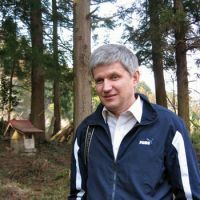 At Ohkubo’s invitation, Zibtsev is spending a week touring northeastern Japan to speak about how radiation impacts forests. He says that by now scientists in Ukraine fully understand how to manage the heavily contaminated forests that cover more than half the 2,600-sq.-km exclusion zone around the Chernobyl plant whose reactor exploded almost exactly 26 years ago — as well as the moderately contaminated forests further afield. “We can forecast 50 to 70 years. 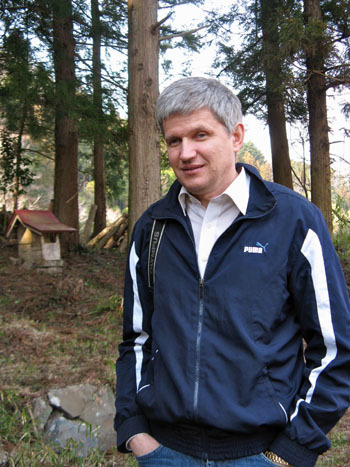 We know when we can harvest those forests and use the wood safely,” Zibtsev says, as Ohkubo drives through the tree-covered hills that still present such a puzzle to Japanese scientists studying the consequences of the March 2011 catastrophes at Tokyo Electric Power Co.’s Fukushima plant. Broadly experienced and sharply intelligent, Zibtsev speaks with confidence about Ukraine’s hard-won knowledge. Yet the lessons, he says, cannot easily be transferred to Japan. Radionuclides move differently through the environment depending on tree type, climate and topography (Fukushima Prefecture is mountainous; the Chernobyl exclusion zone is mostly flat). Also, radiocesium binds strongly to clay soils (common in Japan) but washes easily out of sandy ones (common in Ukraine). And how people use forests for food, fuel, building and recreation influences how much radiation reaches their bodies — while politics, economics and culture sway the success of attempts to limit human exposure. Despite these differences, Zibtsev can offer a career’s worth of relevant experience. His involvement with Chernobyl began in 1993, when a government official asked him to lead a team developing a management system for the contaminated forests around the site. He hesitated: the work was risky, and he had turned down a similar offer in the past. But this time, to advance his career, he agreed. For the next five years, and again starting in 2004, Zibtsev studied the forests. His recent research has focused on minimizing the risk of a catastrophic fire that could endanger firefighters and send contaminant-laden smoke beyond the exclusion zone. From the start, he says, the situation around Chernobyl was complicated by the wide range of radionuclides emitted during the disaster. Whereas in the long term Japan faces mostly radiocesium contamination, Ukraine also has to deal with contaminants including radiostrontium and, near the plant, plutonium. Soon after the accident these contaminants began moving from the surface of plants into the leaf litter and the soil below. From there some of them were taken up by plants, returned to the soil via fallen leaves, and taken up again in a continuous cycle. Where the contamination was highest, some trees died and others grew in abnormal shapes. Starting about 5 to 10 km from the plant, however, Zibtsev says the forests appear normal — if unusually rich in wildlife, due to the absence of humans. Nevertheless, the contamination remains. Zibtsev explains that as long as trees and leaf litter are healthy, forest ecosystems trap radionuclides and prevent them from seeping down into the groundwater, or being carried into streams by erosion — or blowing away as dust in the wind. Ukraine’s management policy has aimed to maximize the role of forests as holding tanks for contamination rather than attempt decontamination. “The approach has been to let the ecosystem work. Fungi is much more effective than millions of people (at containing contamination),” Zibtsev said. 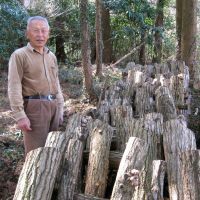 He is skeptical of proposals in Japan to decontaminate parts of the forest by removing leaf litter, undergrowth and tree branches, because such measures could undermine forest health. In Ukraine, that new reality persists 26 years after the disaster. The Chernobyl exclusion zone remains off-limits for living, its forests untouched except for experiments and minimal management aimed at preventing fires, tree disease, and insect infestation (which, by weakening the forest, weakens its role as buffer). Outside the exclusion zone, the government regulates forest use according to contamination levels, which scientists have carefully monitored. Residents receive maps showing where to avoid harvesting mushrooms, hunting wildlife and grazing their livestock. Because food now accounts for 70 to 90 percent of exposure, Zibtsev says, this greatly reduces health risks. But he has come to understand that rules offer only partial protection from exposure. One experience in particular brought that lesson home, he says. Zibtsev was working on a World Bank project with a young Italian colleague, and one day the pair drove out to the economically depressed area just outside the exclusion zone. As they finished up their work, Zibtsev’s old car broke down on the empty highway. It was 9 p.m. and minus 27 degrees Centigrade. They made their way to a nearby village. There, a poor woman discovered the pair of freezing scientists and invited them to her house. In the morning, the woman prepared a pot of mushroom soup for breakfast. However, as Zibtsev and his companion well knew, mushrooms growing on the forest floor serve as sponges for radionuclides. Their root-like mycelium can spread 15 meters or more over the soil, consuming contaminants from a huge area. In that particular village, 90 percent of mushrooms exceeded the legal limit for contamination. “The Italian whispers to me, ‘Sergiy, I’m not going to eat this!’ ” Zibtsev recalls. In the forests surrounding the Fukushima exclusion zone, residents have yet to establish their own balance between necessity, science — and fear. The government has set limits for contamination in firewood, mushrooms and composted leaves, but not other forest products. And while the Forestry Agency recommends removing leaf litter from woods within 20 meters of houses, broader guidance is still lacking. Scientists are still studying how the contaminants behave in lush, mountainous forests. Meanwhile, many forest owners and farmers are unsure how to move forward. When Zibtsev and Ohkubo reach the quiet hamlet of Ogisu, nestled between rolling forested hills, they talk with 69-year-old organic farmer Shigeru Komori about his concerns. 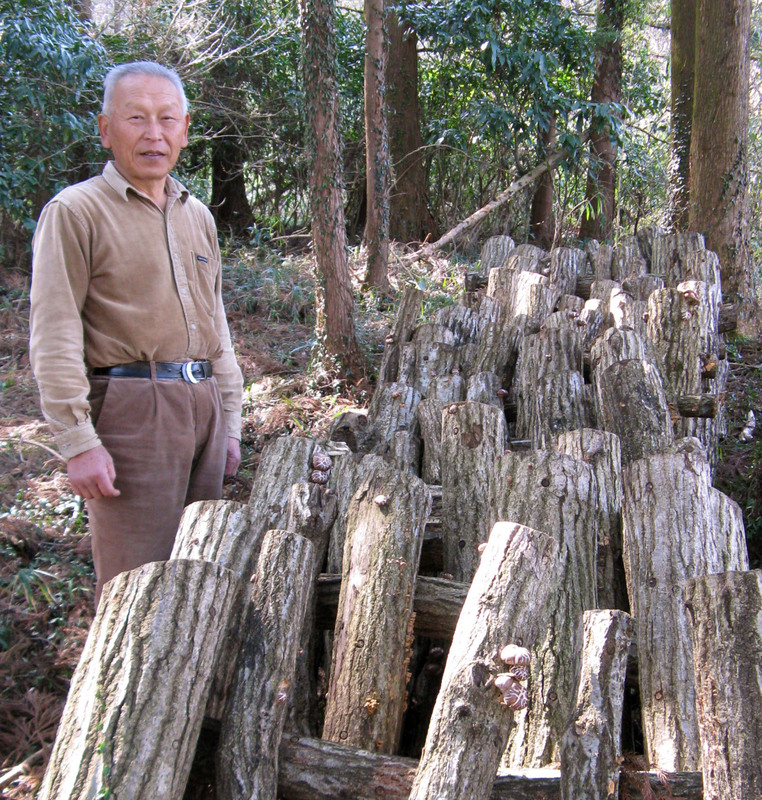 Doses of radiation in the air there are low, and farming is still possible, but Komori no longer adds leaf litter collected from the forest to his rice paddies (a traditional fertilization practice he had recently revived). He has also given up on growing shiitake mushrooms on logs. After listening to Komori and walking through his fields and woods, however, Zibtsev is guardedly upbeat. “The soil is so heavy, there’s no big threat of cesium migration (into groundwater). No one grazes livestock so there will be no cesium from milk. If people don’t break the rules, don’t hunt or eat mushrooms every day, they should be fine,” he says. A moment later, though, he seems to realize the limit of his own argument. By now he is again in the car with Ohkubo, heading through the patchwork of farms and forests towards another speech and, the next day, Fukushima Prefecture. Wherever he goes scientists and residents will be hanging on his words. When it comes to science, he may very well be able to supply the answers they are searching for. As for the messier question of how people should integrate that science into their lives — that’s another matter entirely.